Custom Keyboard Spotlight: Kailh Low-Profile 'Choc' Switches - Dr Wong - Emporium of Tings. Web Magazine. Most keyboard switches currently in production are based on Cherry’s classic designs, and even many of the others at least have support for Cherry-style keycaps. 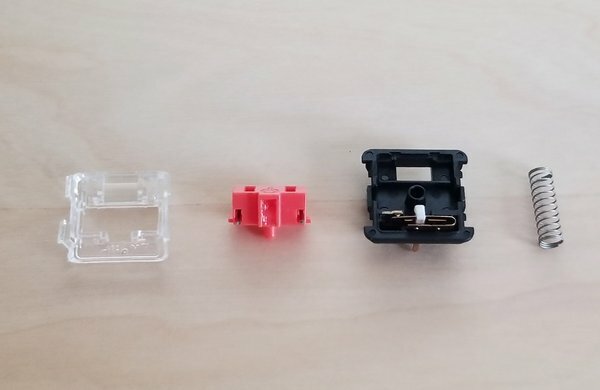 Kailh has a line of increasingly popular low-profile switches that eschew all that. The so-called “Choc” switches (AKA the PG1350 series) take up less space and offer interesting properties, but it’ll be a pain to find keycaps. As you can see in the photo below, these switches are less than half as tall as a standard Cherry-style switch. That means any keyboards built with Choc switches will be incredibly compact. These switches have a total travel of 2.4mm, substantially less than the 4mm or so that other switches have. They come in clicky, tactile, and linear variants just like larger switches. The tactile and linear switches also have a stabilizing wire inside to keep the stem centered. 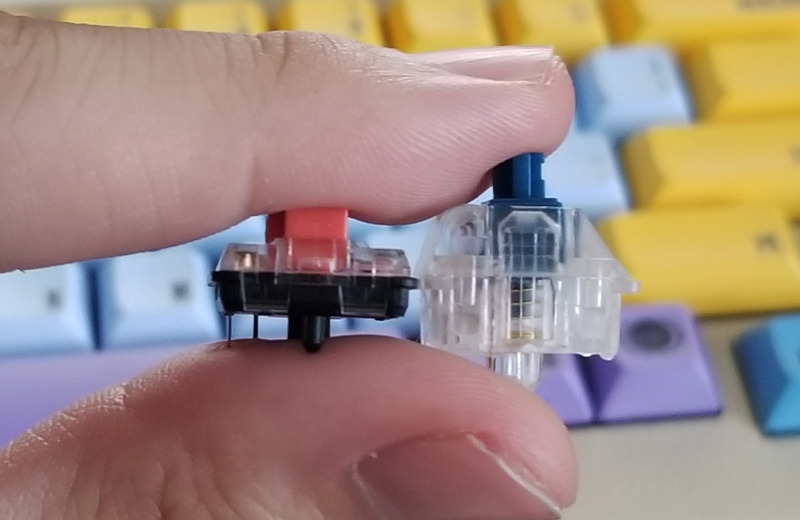 The spring performance of Kailh low-profile switches are generally a bit lighter than their larger siblings. However, NovelKeys has worked with Kailh to create a line of “heavy” variants that come with 70g springs and different stem colors. The disassembled switch below is a Choc burnt orange variant from NovelKeys. The most important difference here is the pin layout. Most PCBs won’t accept Kailh Choc switches because the pins are over to one side of the housing. A few custom boards have support for these switches like the Planck Light. You have probably also noticed the stem lacks the Cherry cross connector. Because of stability and space issues, Choc keycaps use “prong” connectors that look a bit like AC plugs. There are a handful of keysets available for Choc switches, but the selection is minimal unless you want blanks. In most switches, the legs on the stem give the switch its character. For example, a tactile bump comes from a physical bump on the legs. On Choc switches, the switch’s properties are mainly thanks to the channel running up the middle. That piece makes contact with a plastic nub that moves the contact leaf to fire the switch. So, it’s a bit like the BOX design but without sealed secondary compartment. 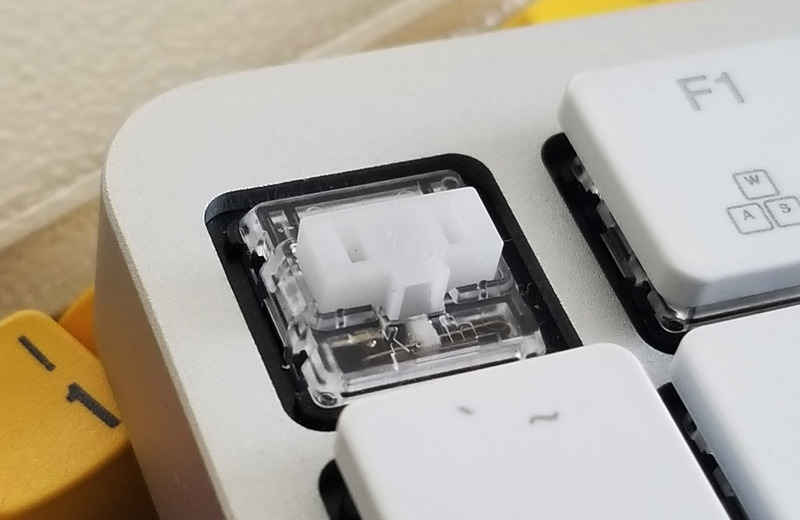 The clicky switches also use a smaller version of Kailh’s click bar design from switches like the BOX Pale Blue. Because of the compact housing, you can’t use in-switch LEDs with the Choc switches. They do, however, have a window in the bottom housing for SMD LEDs on the PCB to shine upward and illuminate the transparent top housing. You can pick up batches of Kailh Choc switches from retailers like NovelKeys, and you’ll find them in various pre-built boards across the internet.